But will it pass TechRadar's screen stress test? 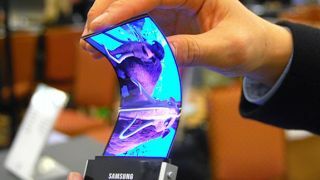 Earlier this year, Samsung took TechRadar behind the scenes to show us some of the bendable tablet and phone prototypes that it's currently toying with. Among those was a particularly intriguing tablet that could be folded twice thanks to its flexible display. A Samsung spokesperson told TechRadar at the time that the company was aiming to get some of its foldable portfolio on the market by the end of 2015, but it now sounds like it could be even earlier than that. A new report by Daum (spotted by Android Authority) states that Samsung is aiming for a commercial launch of a folding tablet in early 2015. The tablet will feature a full HD OLED display that's between 8 and 9 inches and will indeed fold twice, leaving us to suspect this was the very device we played with. The flexible screen market is an unproven ground, but a fully foldable tablet obviously has a lot more sense behind it than the Galaxy Round, the latter of which doesn't really seem to serve a purpose. There's a very good chance that Samsung could launch this tablet in limited numbers to start with so as to not gamble too much on a flexible future.